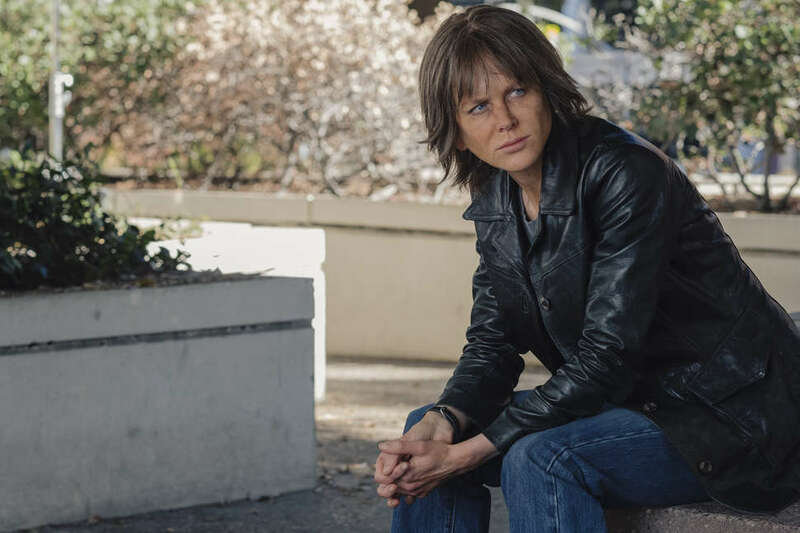 Nicole Kidman looks like her insides are on fire in Destroyer. With a fully transformative performance, the actress disappears into the damaged skin of hardened Los Angeles detective Erin Bell in a film born from the minds of screenwriters Phil Hay and Matt Manfredi. The writers behind The Invitation reunite with its director, Karyn Kusama, to tell an existential character study with a protagonist bound to get under an audience's skin and stay there. Destroyer is a crime thriller with a few pitch-dark laughs, but it's predominantly about regret, time, obsession, and motherhood. As a detective with years of booze and trauma influencing her murder investigation, Kidman's Bell looks like death warmed over -- a far cry from the earlier part of her timeline, when she was undercover in a gang of criminals with her partner, Chris (Sebastian Stan), in a isolated desert setting. The law enforcement officers developed an intensely intimate relationship as they infiltrated Silas' (Toby Kebbell) gang of low-rent robbers on the verge of pulling off another heist. Years later, the audience sees how Erin Bell is haunted to her core by her undercover experience, and the reasons why are revealed by Hay and Manfredi with a precise but unexpected punch. The writing duo conceived of the basic idea for Destroyer more than a decade ago, but when they realized their old-fashioned cop drama was actually as much about motherhood as it was about hard-boiled action, that's when the story clicked. "I think once we knew that Shelby (Jade Pettyjohn), her [distant] daughter, was going to be such an important part of the movie, that taught us things about Erin," Manfredi says. "Then we started opening up the conversation with Karyn a little bit in understanding and getting more excited about who this person was and could be." After figuring out their protagonist, they knew her story had to be a sprawling Los Angeles odyssey, both realistic and dreamlike, inspired by classic movies such as Klute and To Live and Die in L.A. "The drive of the character was what was appealing to us," Hay adds. "We know Erin is doing things that are wrong and unlikable and approaching things from an unhealthy place. The fact that she keeps going -- the drive and the obsession -- I think that shares with the movies from the '70s we really enjoyed." Classic influences aside, Destroyer eschews most cop movie clichés: There's never any district attorney on Bell's case or a police chief shouting about the mayor breathing down their neck. While the writers embrace genre elements, Destroyer is defined more by its characters than genre staples. "We wanted to approach it, first and foremost, as a character story," Hay says. "I think we find, for us and Karyn, the most profound characters are in genre movies, whether it's a thriller, a cop story, or a science-fiction movie. In those movies when the characters are treated with care and focus, they are some of the most inspiring movies to us. We always wanted this movie to sit inside the genre of the cop thriller, specifically the LA crime thriller, which is its own thing. We wanted it to sit within the idea of the noir, but what we had hoped to do was give the fullness of Erin's humanity its time in court." Kusama shows with intensity and reflection the full extent of Bell's humanity, including piercing close-ups of Bell at her most ferocious and vulnerable. How the grizzled and divorced detective looks and moves, as if she's broken, is enough on its own to draw empathy. "When she's introduced in the script, the only descriptor is that she's -- paraphrasing -- 'blinking into the sun, which is very hard,' and 'she's a cop, and she looks pretty rough,'" Hay recollects. "That's just the starting point. Sometimes on set, Nicole joked to us, 'Oh, here's another person telling me how bad I look.' We had a specific idea of how she felt and kind of looked in our minds, but, for example, the way she moves, really organically came from Nicole and her conversations with Karyn, and with us, but mostly with Karyn about why this character moves the way she does, which is so specific. Nicole created such a specific carriage for herself. We always think of her as a coyote, and she really responded to that." Kidman responded so much to that idea that Kusama sent her videos of coyotes wandering around the suburbs. Since Hay and Manfredi are also producers of Destroyer, they saw their character take shape in Kidman's hands on set. "We're always there [on the set], so we can always have these conversations," Hay continues. "Nicole loved the opportunity to just sit with Karyn, Matt, and I and get into all the different levels of the character, whether they're physical or metaphysical." When Bell is younger, more vibrant, and undercover in the unforgivingly hot Palm Desert, her physicality and presence is like a completely separate performance. She's a different beast altogether from the coyote roaming Los Angeles years later, crossing paths with Silas' gang. All of them -- including Bell -- are barely holding on to life. "Another reference we kept using, and Nicole felt she connected with, was the idea of a desert rat," Hay says. "When she was a young punk, we'd call this character the desert rat and think about what it means to grow up in the desert, what the sun would do, and metaphorically, what that blaring exposure would do to you. Another detail along those lines, when we shot her final scene with her daughter on the mountain [when they get lost in the winter], we shot that very last. It was an 85-degree day, which was fascinating, but we were talking about that moment and she said when she encountered that in the script, she cried. She really felt that deeply. We talked about how some part of the story is a really primal story about a mother, an animal mother and her child, and her survival." There were instances on the set when, while watching their lines delivered by actors like Kidman, Bradley Whitford (playing a rich sleaze), and Scoot McNairy (co-starring as Bell's ex), the screenwriters' perception of what they wrote would alter. "It happens in little ways all the time," Manfredi says. "This is a very small moment in the movie, but when Bell is sitting across from her daughter in the [confrontational] Chinese restaurant [scene], they're just doing a few takes of Shelby's line, 'Are you still drunk?' Nicole ran through five different ways of playing the reaction to that. She was just probing and exploring that moment and what that means to have your daughter say that to you in the middle of the afternoon. It was just a thrill to watch the different meanings she could find in that." It's a thrilling performance to witness, as well. Detective Erin Bell is one of the most hypnotic characters Kidman has ever played -- a protagonist who's unsettling to watch, yet impossible to ignore. "Nicole is so interesting," Manfredi concludes. "She's willing to have an intellectual conversation about it, and an intuition-based conversation about it at the same time. She has a lot of different ways to approach these things, and that's really gratifying for us to work. Especially with this character, she really approaches things on very whole terms, but in very intense terms. I think she felt a very intense connection with this character, but also a difference, so there was a lot for her to chew on."